It always happens to me. I start off with good intentions and take a load of photographs before everyone arrives. Then Jay says do you want to try this year’s cider and it’s down hill to Monday morning. But I can vaguely remember it being one of the most pleasant and relaxed baking weekends we have had. I did still manage to take a few more snaps. Old stagers Ben and Robin either side of newcomer Paul and Bella on the right. It got quite warm in that tent – no trouble with proving but the starters went berserk. Bella’s Couronne Bordelaise in the centre. Claire’s Artichaut might not have behaved perfectly but looks totally beautiful. Two professional bakers (Rick & Adam) plan retirement. I did a bit of dabbling myself – I managed to confuse two bread formulas that appeared in the recent Bread Bakers Guild of America mag. 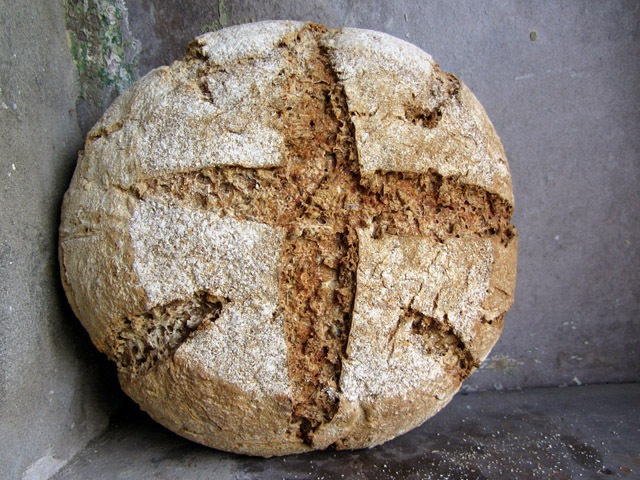 The first was a Golden Kamut Bread with sprouted Kamut grain; the second, called Gone Awry Bread because of the problems it caused before the formula was perfected, had two starters (wheat & rye) and grain that had been used in beer brewing. I had some barley cooked in beer in the bottom of the freezer from last time I baked Cistercian that I intended for the Gone Awy. The only other grain I had was rye so I sprouted that in advance to substitute for the kamut. So far so good. 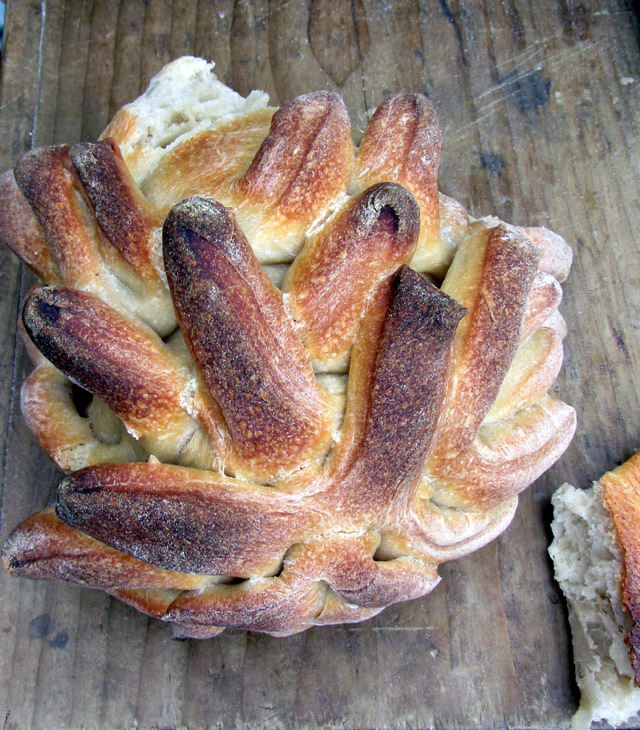 Fabulous chewy, flavoursome bread. I gave half to my German neighbour, Steffi. She sniffed it and went into a sort of trance. “It smells of Germany” she said. Looks like I’ll be baking it again.